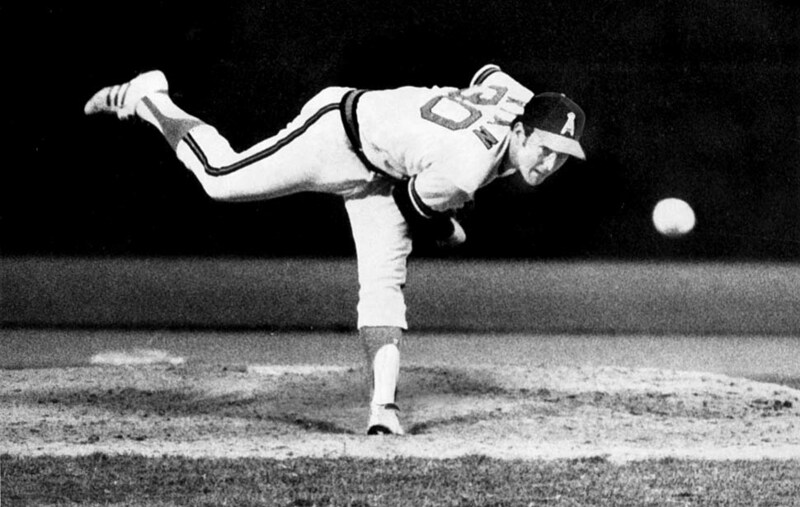 June 14, 1974: California Angels pitcher Nolan Ryan throws one of 235 pitches during his 13-inning effort against the Boston Red Sox— resulting in no decision. Nolan Ryan seemingly could have pitched forever. The Angels’ hard-throwing right-hander struck out 19 Boston Red Sox batters in 13 innings Friday night — breaking his club one-game record by two — in a game at Anaheim Stadium that seemed as if it would never end. And when it finally did end in the 15th, shortly after midnight, Denny Doyle’s double into the left-field corner off loser Luis Tiant – who pitched all the way – drove in Mickey Rivers from first with one out to give California a 4-3 win over the Eastern Division leaders….. This photo was published the next morning along with Prugh’s story. When contacted for this story, Ryan asked that the box score from that game be faxed to his office in Texas. After reviewing it, Ryan said two memories stood out: striking out Cecil Cooper six times and “not wanting to come out” after heaving his final pitch, which yielded a ground out to second by Carl Yastrzemski. By today’s standards, [Luis] Tiant and Ryan each pitched more than two “quality starts” — six innings, three earned runs or fewer allowed — on the same night. The Angels did not re-sign Ryan after the 1979 season. As a free-agent, Ryan joined the Houston Astros. Ryan is currently the owner, chief executive and president of the Texas Rangers baseball team. Photo credit on this image is also a no decision. When published on June 15, 1974, Times staff photographer Larry Anderson was credited. But a recent check of the original print found Cliff Otto’s name on the back. Both photographers worked for the Orange County edition at the time. Efforts to clarify were fruitless. So I am leaving the image uncredited.